Have You Been Putting Off Estate Planning? Among the issues our lawmakers managed to agree upon in 2013, one in particular – the rules around federal estate taxes – has increasingly important implications. For years, uncertainty about how much of their estates might be taxed and at what rates made it easy for baby boomers to postpone the estate planning process. But now that the rules have been made clear, boomers and others have a golden opportunity to make the future more certain and financially secure for themselves and the people and causes they care about. 1. What’s changed regarding estate taxes? The $5 million federal estate tax exemption is now permanent, with an inflation adjustment setting it at $5.25 million in 2013. Incremental increases to this exemption will be triggered automatically each subsequent year. 2. If the rules are better now, why is planning so important? In 2011, the first baby boomers turned 65. 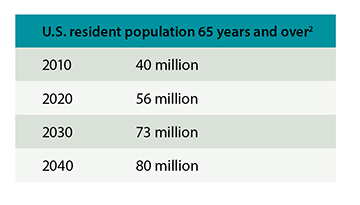 Approximately 10,000 more are expected to cross that threshold every day for the next 17 years.1 At the same time, life expectancies are getting longer, setting the expectation that our older population will continue to grow (see chart below). 3. What’s involved in comprehensive estate planning? Planning documents should be reviewed by a qualified attorney every three to five years, or if significant life events occur, including a death in the family, a change in residence or marital status, disability or chronic illness. A truly comprehensive plan will also look at issues related to incapacity, asset protection, insurance and retirement income. Depending on your priorities, location and preferences, you may also consider charitable legacy planning, planning for state taxes, Medicaid planning and pre-planning funeral arrangements. If you’ve been putting off estate planning because of the uncertainty surrounding the rules, you should do it now. And if you are worried that it might be too complicated, remember you don’t have to do it alone. Your Baird Financial Advisor, backed by a team of highly credentialed estate planning specialists, can work with your attorney to ensure that your plan is appropriate for your current situation and ultimate goals. Robert W. Baird & Co. does not provide tax or legal advice or services. 2 U.S. Census Bureau, Population Division.